Imagine standing on the 18th tee box. It’s a reachable par 5 if you can hit a great tee shot. A great driver sets you up to hit on in two and maybe end the day with an unlikely eagle. Or worst case, a short birdie putt to finish the round. The problem is that it requires a 10 yard draw to cut the corner and give you a perfect angle into the hole. Can you pull the shot off? Do you know how to hit a draw? Most amateurs don’t but you absolutely can. As I’ve written about extensively, most amateurs struggle to hit a draw because of an over the top motion that causes the ball to slice. But, if you can learn how to hit a draw you can begin to make some serious improvements in your game. In the past, when you have tried to hit a draw and pull the shot off, how good does it feel? It’s amazing to see the ball take off right and draw back to the middle of the fairway or attack the pin. The draw is powerful, crisp, and the ball seems to stay in the air forever with the longer clubs. While some pros play the power fade as their go to shot, most PGA tour players favor hitting a draw. Hitting a draw does several things for your game. The first is that hitting a draw, especially with your driver, can add 5-15 yards depending on the speed of the fairways. If they are like the British Open it could be even further! Draws produce more top spin and thus more roll out once it hits the ground. The longer you can hit the driver, the shorter clubs you’ll hit as approaches and typically lower scores you can post. The other main advantage is it gives you more options throughout the round. Even if you don’t play a draw on a consistent basis, if you know how to hit one it can help save you strokes all around the course. Whether it’s hitting a punch draw around a tree or playing one against a left to right wind. But this is the shot that most amateurs can’t pull off because of a few mistakes that can easily be fixed. If you learned how to hit a power fade in my last post then you can learn how to hit a draw as well. Here’s how to fix the common mistakes and finally learn how to hit a draw consistently. Before even addressing setup, remember the new ball flight laws. To hit a draw you must have a closed clubface at impact to turn the ball right to left. It’s impossible to hit a draw with an open clubface. A lot of the draw starts with the setup and is the exact opposite of the fade. Before even addressing the ball you need to change your grip slightly. Here are two easy ways to adjust your grip to make it easier to draw the ball. Rotate your right hand to the right. 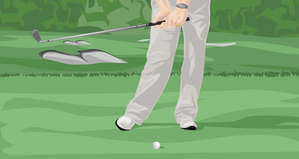 By rolling your hand underneath the club you are strengthening your grip. This will allow your wrists to be able to roll over easier at impact. Think of hitting a draw as a baseball swing motion where your hands are turning over at impact. Grip the club as normal with more pressure on your right hand. This doesn’t mean you should weaken your left hand strength. But adding more pressure to your right hand will also help roll the club over at impact. Some coaches teach one grip idea while others teach another method. Don’t go to the course and try them during a round. Instead, spend time on the range working on both grips and see what feels more comfortable for your own swing. To give yourself the best chance to hit a draw you need to grip the club correctly and align your body properly. Start first by stepping away from the ball slightly. For a fade, you want to crowd the ball to pinch it and help the ball go left to right. But, for a draw you want to feel like you have more room to come into the ball from the inside. This small shift will allow you to have enough room to get the ball started to the right of the target. 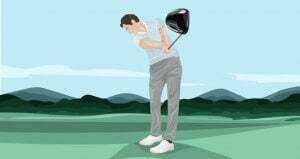 Next, close your stance by dropping your right foot back an inch or two at address. Unless you’re trying to hit it really high, you also want to move the ball slightly back in your stance. This is very minimal and will make sure to adjust your ball position accordingly for each club. The last part of the setup is all about the alignment. 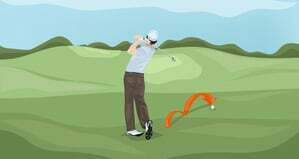 If you are able to hit a draw and are aimed at your target or even left you will have some big misses. 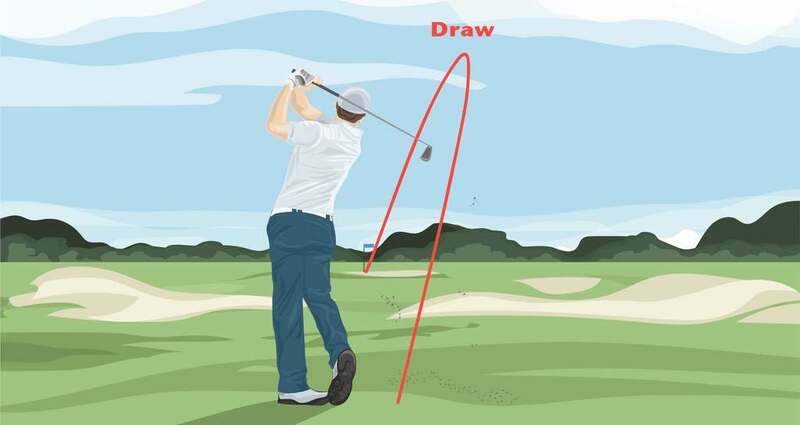 The longer the club the more it should draw so make sure to aim accordingly. 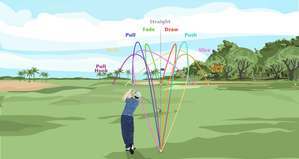 A draw for a 5 iron might be 5-7 yards while a 9 iron might only be 3-4 yards. Be very specific with your alignment and make sure your feet and shoulders are right of the target. Proper alignment will allow you to swing along the path of your feet and shoulders to hit a perfect draw. Start by checking your woods and make sure they are at a neutral or draw setting. If you fade the ball a ton and want to start hitting a draw you might have to adjust a little more than standard draw setting. If you want to be able to play both a draw and fade, make sure to set the club back to a neutral position. Remember, if you want to hit a draw your clubface has to be slightly closed at impact. This requires you to pick a target based on what club you are trying to hit a draw with. Remember, longer clubs will draw more and tend to carry farther than hitting it straight or playing a fade. Choose your club accordingly! Make sure you are 100% committed to picking a target before taking your practice swings. This will allow you to take a few practice swings imagining the ball turning over from right to left. Rehearse the club coming from the inside and think about swinging more out, toward the target. You might be thinking, this sounds good but don’t I need to turn my hands over, take the club inside, or do something else to hit the draw? Thanks to the new ball flights you actually don't need to do much else. The main thing you need to do to make sure the clubface is closed at impact. Don’t try to manipulate the club by swinging right or taking it way inside on your backswing. 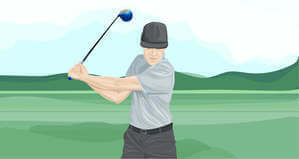 Instead, at address position, before you grip the club turn the face closed. The more you want the ball to draw the more it should be closed at address. Simply turning the clubface closed will allow you to not have to do much else to your swing. Too many swing thoughts, especially mid-round, can make it impossible to execute a shot. The last part is to make sure you tee up the ball on the left side of the tee box. This gives you more room to aim right and visualize the shot turning back to the left. Watch this video to make sure you are setting up your alignment and clubface accordingly. Another great recovery shot to have in your bag is the low running hook shot. If you end drawing it a little too much and find trouble on the left you might need to have this hero shot to get you back in play. One disclaimer, don’t try this shot from deep rough as the clubface already shuts in the deep stuff this and won’t help! 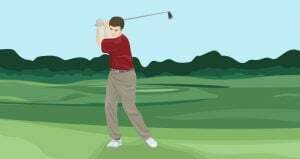 Start by using one or two fewer clubs as the power draw (or hook) will close the face and draw the ball producing more topspin and roll out further. Choose the right setup position depending on the shot. If you want to hit it low make sure the club is in the middle to back part of your stance. Next, adjust your clubface by slightly closing the club at address. If you’re trying to hit a 15+ yard draw/hook then you will need to adjust your swing path more to the inside. All these components should lead to a low, piercing right to left ball that will roll out and get you back into position. 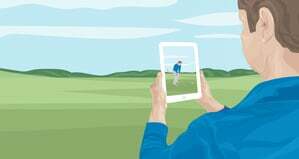 The draw is an elusive shot for most amateurs but it doesn’t have to be anymore. Don’t overcomplicate things by trying to take the club inside or roll your hands too much at impact. Instead, grip the club properly, adjust the face at setup, and swing toward your target. 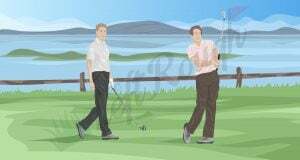 Hopefully, you can start hitting a draw, add distance to your drives, and start impressing your buddies on the next round!